Z71 Off Road Pkg, 5.3L V8, 4x4, Navigation, Apple/Android CarPlay, Power running boards, heated leather seats, backup camera, automatic headlights, fog lights, Home Link, blind spot drivers mirror, dual automatic climate control, power windows/locks/mirrors, keyless entry, AM/FM, SiriusXM, auxiliary and USB port, steering wheel mounted audio contols, Bluetooth, dual power seats with power lumbar, tilt steering wheel, cruise control, information center, 18" Chrome wheels. Warranties: Balance of GMC's 3 year or 36,000 mile bumper to bumper and 5 year or 60,000 mile powertrain. In service date: 04/03/2017. Extended service contracts available. The 2016 GMC Sierra 1500 is a full-size pickup offered in a variety of cab/cargo-bed configurations in both two- and four-wheel drive. Body styles include regular cab, extended (double) cab and crew cab. Regular cabs can be had with either a 6.5-foot standard bed or an 8-foot bed. Extended cabs come with the 6.5-foot standard bed, while crew cabs can be had with either a 5.8-foot short bed or the 6.5-foot standard bed. There are four trims. 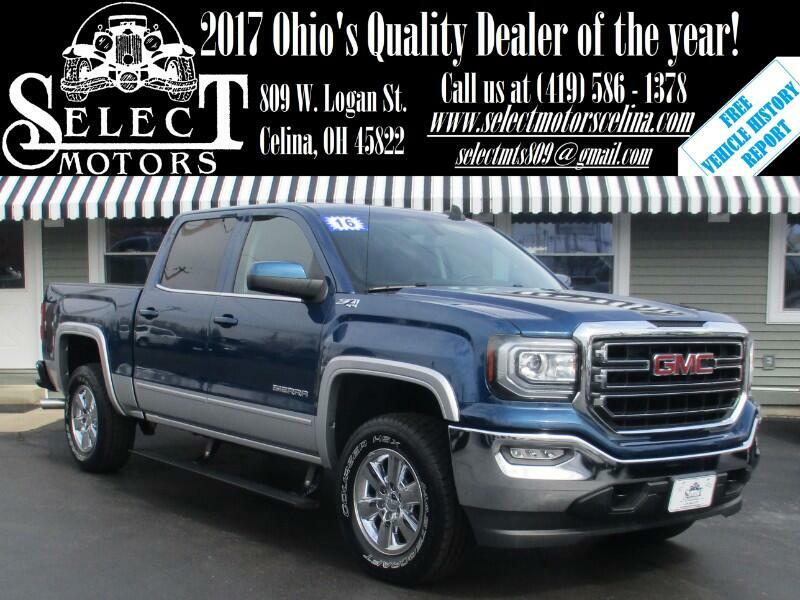 The base and SLE Sierra are available in all body styles, while the SLT is offered as a double cab or crew cab, and the Denali is crew cab only. The base Sierra comes standard with 17-inch steel wheels, automatic xenon headlamps, power locks, a locking tailgate, power windows (double and crew cabs), air-conditioning, cruise control, a 40/20/40-split front bench seat, a folding rear seat (full-width double cab, 60/40-split crew cab), a tilt-only steering wheel and a sound system (four-speaker for regular cab; six-speaker otherwise) that includes a 4.2-inch color display, USB connectivity and an auxiliary audio jack. With four-wheel drive, the base Sierra features a floor-mounted transfer case. The Sierra Convenience package adds remote keyless entry, a remote-locking tailgate, heated power mirrors (with an integrated driver-side blind-spot mirror), a rearview camera, a 110-volt AC outlet, LED cargo box lighting and, on the regular cab, power windows. The Elevation Edition includes those items plus special 20-inch black alloy wheels, LED foglights, tinted windows, body-color exterior trim, carpeted floors (versus vinyl), a 7-inch IntelliLink touchscreen interface, OnStar communications, a Wi-Fi hotspot, Bluetooth phone and audio connectivity, Pandora internet radio, and Apple CarPlay and Android Auto. Apart from the Elevation Edition's special wheels and styling elements, the Sierra SLE includes all of the above plus 17-inch alloy wheels, an electronically controlled transfer case (4WD), a damped tailgate, a leather-wrapped steering wheel, an 8-inch IntelliLink touchscreen, HD and satellite radio and a CD player. The SLE Convenience package adds rear parking sensors, a rear window defogger, a sliding rear window and power-adjustable pedals. The SLE Preferred package adds a tilt-and-telescoping steering wheel (V8 only), an eight-way power driver seat and dual-zone automatic climate control. The SLE Value package adds the same items but further adds trailering equipment and a rear locking differential with two-wheel drive. Those living in the Lone Star state get a special Texas emblem added to their Sierra when the SLE Value package is ordered. Other SLE options include leather upholstery and a heated front bench seat, or cloth-upholstered front bucket seats that include power lumbar adjustment, a six-way power passenger seat, a full center console and wireless smartphone charging. The SLT comes standard with the 5.3-liter V8 engine, includes all of the above equipment (the bench seat remains standard) and adds 18-inch alloy wheels, chrome exterior trim, LED taillights, power-folding mirrors with driver auto-dimming and puddle lamps and driver-seat memory settings. Leather-upholstered front bucket seats are optional. The SLT Preferred package adds front and rear parking sensors, a power-sliding rear window and a heated steering wheel. The SLT Crew Cab Premium Plus package adds those items plus 20-inch wheels, full LED headlamps, tubular side steps (available separately), heated and ventilated front bucket seats, a spray-on bedliner, a navigation system (available separately on the SLE), a Bose audio system and the Enhanced Driver Alert package (see Safety section). The crew cab can be equipped with a sunroof and an Entertainment package that includes a single 9.2-inch display and a DVD/Blu-ray player. Available on the SLE and SLT crew and double cabs is the All-Terrain package, which adds 18-inch wheels, an off-road suspension featuring Rancho shocks, an underbody shield, a unique grille, rear parking sensors, a spray-on bedliner and an auto-dimming rearview mirror. The All-Terrain SLT Premium package adds 20-inch wheels, front parking sensors, a heated steering wheel and a power-sliding rear window to those features. The GMC Sierra 1500 Denali includes special exterior styling elements, 20-inch wheels and adaptive magnetorheological suspension dampers (GM's Magnetic Ride Control) along with most of the above equipment (the sunroof and Enhanced Driver Alert and Entertainment packages are optional, and the All-Terrain package is not available). The front bucket seats are standard. The optional Tri-Mode Power Steps package includes a rearward articulating power-deploying step for bed access and foot-activated, power-deploying side running boards.